The ideal solution for fixing components is UV gluing technology, borrowed from aeronautic engineering, which has found fantastic applications in the glass industry as it makes it possible to obtain invisible adhesion while guaranteeing a high mechanical resistance. Over the course of 2016, the Samo Industries group developed this technology to be used on some of its products. Compared to traditional gluing, where the adhesive is left to air dry or is set using other reactive substances, this technology uses special lamps that emit UV rays. The glues used for this technology polymerize once they are exposed to ultra-violet rays, guaranteeing a rapid and safe joining of the parts involved. This technology can be used to glue a wide variety of materials, covering various fields of application. In our case, this technique is applied in the joining of metal elements (hinges, fixing elements, handles) to the glass. Waterproofing performance - The main function of a shower panel is to prevent water from reaching outside the stall itself. This waterproofing performance depends on the type of shower panel. prevents water from splashing beyond the panel. For this reason, these products have excellent waterproofing performance. this solution offers excellent waterproofing, but does not guarantee that water will not splash out. this solution offers limited waterproofing performance and does not guarantee that water will be totally contained. A distinctive technical feature compared to classic shower stall solutions is certainly the slow closure for sliding doors. Soft Close components and systems make it possible to open and close sliding doors gently and silently, thanks to a completely invisible mechanism. Sliding doors have been using for years a panel release system consisting of the possibility to release the lower part of the sliding panel and move it away from the fixed panel to facilitate cleaning. A technical must-have of a shower panel is the “Internal glass support” common to all crystal support components. This support is within the thickness of the glass itself. 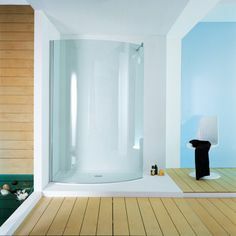 Shower stalls with this feature are particularly easy to clean, as the internal surface of the glass is not subject to changes in thickness.